The Euroleague’s 2013 Nike International Junior Tournament started in London today for four first round contests. Defending champion Lietuvos Rytas Vilnius dropped their first game to Joventut, 77-65. 6’5” Alberto Abalde (1995) led Joventut with 21 points, making 3-of-6 three-pointers. 6’8” Jose Nogues (1995) helped out with 11 points and seven rebounds. 6’9” Gediminas Zalalis (1995) led Rytas with 14 points and 6’5” Benas Vaitulionis (1995) had 12 points. Joventut pulled out to a 35-22 halftime lead and scored 12 straight points in the third quarter to put the game away. It was a poor shooting game as the teams combined to shoot 7-of-35 on three-pointers. Crvena Zvezda Telekom Belgrade had no problems in an easy 86-61 win over Team China. 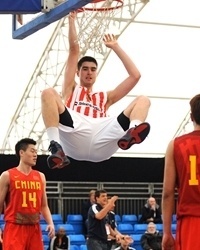 6’10” Dusan Ristic (1995) dominated play inside scoring 18 points on 7-of-14 shooting and grabbing 16 rebounds. 6’10” Marko Tejic (1995) also scored 18 for the winners connecting on 8-of-10 shots and added six boards. 6’1” Nikola Rebic was effective running the point scoring 11 points on 5-of-6 shooting while getting five assists against only two turnovers. 6’5” Li Jinglong led Team China with 19 points but shot only 5-of-15 on three-pointers. Team China was out-rebounded 54-25, as Crvena used their superior height to control the boards. The two teams combined for 37 turnovers. The winners led 24-10 after the first quarter and never looked back. OKK Spars Sarajevo, making their first NIJT appearance used a 25-12 fourth quarter advantage to top INSEP Paris 76-57. 6’11” Doko Salic (1995) dominated the game with 26 points on 10-of-14 shooting, 15 rebounds and 11 fouls drawn for the winners. 6’0 point guard Aleksej Nikolic was all over the court contributing 18 points, nine assists and eight rebounds. 6’5 Nedim Buza (1995) came on strong in the second half in getting a double-double with 17 points and 11 rebounds. 6’4” Damien Inglis (1995) led INSEP with 12 points and five rebounds, shooting 4-of-6 from the field. 6’2” Charly Pontens helped out with 11 points and four assists. Spars had a 47-28 rebounding advantage, led by Salic. In the final game of the first day, FC Barcelona Regal beat Team England 69-58. Barcelona put the game away with a 27-7 advantage in the second quarter which enabled them to take a 46-22 halftime lead. England made the final score closer with a 21-7 final stanza. 6’4” Adria Cantenys (1995) led Barcelona with 15 points, hitting two three-pointers and grabbing six rebounds. 6’1” Xavier Moix (1995) added 14 points making 3-of-4 three-pointers. 6’6 Marc Garcia (1996) helped with 10 points for the winners. Highly touted 6’6” Mario Hezonja (1995) had a relatively poor first game with 6 points on 1-of-6 shooting, 7 rebounds, 4 assists and 6 turnovers. 7’1 center Kingsley Okoroh (1995) led Team England with 12 points and 12 rebounds. UC-Irvine recruit 6’3” Luke Nelson added 11 but shot only 1-of-7 on three-pointers. 6’10” Benjamin Lawson added seven points on 3-of-5 from the field and came up with four steals. I would like to express my thanks to this writer for bailing me out of this type of setting. Just after researching through the world-wide-web and meeting things which are not productive, I figured my entire life was over. Living without the strategies to the issues you have solved all through the article content is a serious case, and the kind which may have in a negative way damaged my entire career if I hadn’t discovered the website. Your natural talent and kindness in touching all the stuff was very useful. I don’t know what I would’ve done if I hadn’t discovered such a point like this. I’m able to at this time look ahead to my future. Thank you so much for the professional and effective guide. I will not think twice to refer the sites to anyone who should have counselling on this issue.